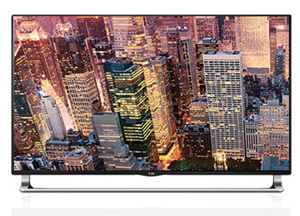 The 55LA9700 is LG's premium smaller sized 4K LED TV for the year. It have a few key upgrades from the LA9650 that bump up the picture and sound quality to make it a real contender in the 4K space. The design of the TV is also much nicer than the LA9650. The Nano Full LED technology is as good as it gets when it comes to panels from LG. This provides the micro dimming on the TV to control the contrast in specific areas of the screen for the best possible image. The real kicker is the retractable built-in sound bar. When the TV is on, it comes out to provide 4.1 channels of audio with 50 watts of power. When the power is off, the sound bar disappears to keep the attractive look of the set. There is about a $1,000 difference for the upgrade from the LA9650, so it may only be for those who really want the newest technology in their living room. The Tru-Ultra HD Engine is in chage of upscaling duties on the 55LA9700. Since the selection of 4K content is still sparse, the upconversion quality is very important on TVs like this one. LG doesn't have a content distribution system like Sony, so it is even more important for this to be excellent. The LG9700 uses a 4 step process to examine and enhance broadcasts, recorded video, and home video game consoles. The result is a sharp and clear picture on a 4K screen. This technology is only available on the LG LA9700 series this year. It is their most advanced display technology to LED TVs and it shows. The 144 different blocks of LEDs make it possible to get the perfect contrast and color levels out of different parts of the screen. Combine this with the wide viewing angles of the IPS panel and an excellent picture is the result. The 55LA9700 looks a bit different from the LA9650. The minimalism is much more apparent in this model. The Cinema Screen design provides very thin black bezels and a super slim profile. The stand is an upside down 'y' shape that runs across the entire bottom of the TV. The width of the stand may be a problem for smaller TV stands. The slide out sound bar is the highlight of the design. The TV looks very simple when off, but the sound bar slides out fill the space between the base of the screen and stand. LG's Smart TV platform is a welcome addition to the 55LA9650. You are going to find many of the offerings present in all manufacturers' smart TV platforms. Thing like Netflix, Hulu Plus, YouTube, MLB.tv, Facebook, and Twitter are now the standard. They offer an extensive array of Apps such as Puzzle Quest, Germs Palace, and the White House. The selection is complete and pretty compatible with other manufacturers. It's very attractively laid out and super easy to control with the Magic Motion Remote Control. There are a number of new interaction features as well for smartphones and tablets. Near Field Communication (NFC), Miracast, and Widi are just a few ways to bring content to the big screen from your mobile device. The new Magic Wand Remote included with the 55LA9650 has seen a number of improvement since last year. In our reviews last year, we thought the magic remote was a handy inclusion that really helped navigation in the menus and in the web browser. We are happy to welcome it again with new voice features. The LA9650 magic remote doesn't have the QWERTY keyboard that is present on LG's new Google TVs, but that's okay. Since the LA9700 features some of LG's most advanced picture quality technology and the unique slide-out sound bar, you are going to pay a premium. At $4,500 it is much more expensive from competing models from Sony and Samsung. $1,000 more expensive to be exact. The Sony XBR-55W850A and the Samsung UN55F9000 also offer strong picture qualities and robust Smart TV platforms. TV without stand (WxHxD): 48.43" x 28.11" x 1.58"
TV with stand: 48.43" x 30.75" x 10.79"